Got some more exciting news for you all! 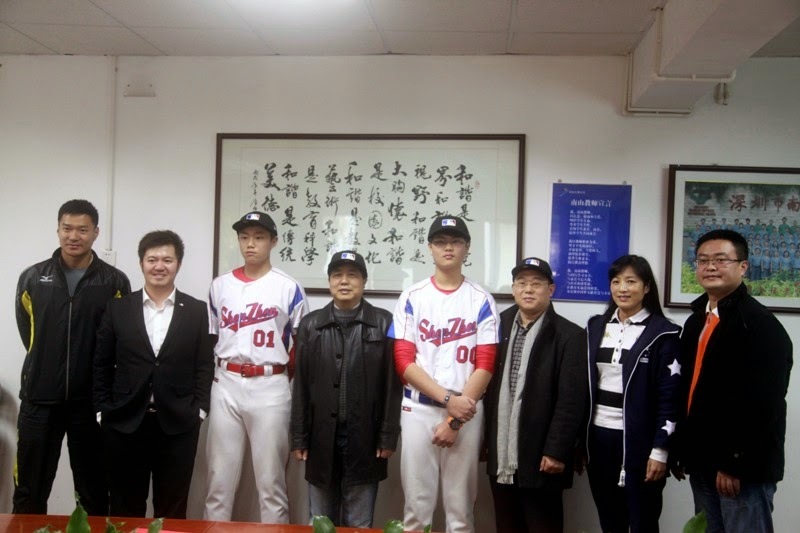 Two students from Shenzhen OCT primary school have been selected to join China's MLB development academy. One of them is Xie Han Zhang 谢瀚樟, a left handed pitcher who just graduated recently and the other one is Ding Ruo Fei 丁若非, who is currently in sixth grade. As you can see, they are both pretty tall (180 cm) for their age. Can you imagine facing Randy Johnson when you just turned twelve? Unfortunately, not a lot of other information about them, but the potential is definitely there. We'll just have to wait a couple of years and see how they turn out. Good luck 加油! I also want to thank Mr. Philip Wang for helping me find this information. We are both very optimistic and passionate about baseball in China. From here on out, he will be assisting me with translations and possibly interviews with players from China. I welcome him to the cause! New Year, Great Start! I hope the train doesn't stop here! Thanks for reading and have a great night!